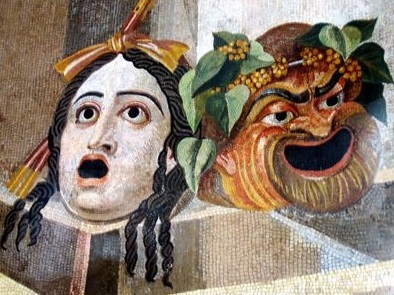 Some teachers adore the cliche that a teacher's presentation in the classroom is artistic or theatrical. These people are often very needy and teaching is probably one of the worst professions they could enter. Such people make dangerous teachers because they are flattered not only by the idea that all eyes are upon them but also by the pretense of artistic creativity, for both elevate what may be an inglorious and mundane profession. Such teachers should beware: do not seek favor or attention from your students and dot not make yourself the center of attention. This is a path to personal and professional catastrophe. Teaching is not a performance because you are the star or the genius, but it is a performance for two reasons. First, like an actor you have to control yourself. Completely. If you cuss a lot, you need to cut it out. If you are short-tempered, grow patient. If you easily lose your train of thought or need frequent breaks, learn to follow through. If you are disorganized, get organized. If you are easily distracted, learn to focus. And so on and so on. Obviously you can take this too far and make yourself a bundle of nerves, but realize some behaviors just won't cut it for a classroom teacher. I can't list them all, but watch how your students respond to you and search your heart. Does your temperament suit the kind of class you are trying to create? Can you change it? You can't change everything at once, but you most certainly cannot do the opposite either, and the opposite is another cliche, be yourself. In fact, that's probably the worst thing you can do. Second, teaching is performative because ideally the teacher should disappear and the impression left upon the minds of the students should be that of the material. This doesn't mean that your zeal, style, and unique take on the material are irrelevant, but that they should serve the understanding of the content and not take center stage. Here too are the extremes instructive. Some teachers are too much of a presence in the class. Too much talking, interference, jokes, asides, theatricality, and so on. Although they are usually enthusiastic about the material, they overwhelm it. Other teachers are nonentities in the room. Usually by lack of discipline or just by being boring, they don't bring the material out of the realm of concepts into the real world. The lesson is dead on arrival. Now you don't need to be a cheerleader, but kids need to see some heart. In a nutshell, students need to see someone animated by the knowledge that they are articulating. They need to see only those parts of you, and those parts controlled, that let the ideas shine out. 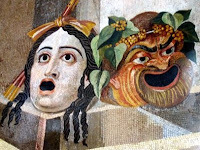 Like an actor on the ancient Greek stage, some of you will disappear behind the mask and some of you will be the medium for the ideas. Unlike the actor, though, you have no physical mask and you need to possess the understanding of yourself to decide which parts of you may and should come forth for the sake of learning. It is a tall order and its prerequisites are not vanity and narcissism but discipline and self-knowledge, but through such teaching "performance" students will see ideas neither dull and etherized for dissection on the table, nor just barely peeking out from under your personality, but alive, present, and deserving attention and concern. In this way the teacher transforms the knowledge, the student, and himself. The morning to church, where mighty sport to hear our Clerk sing out of tune, though his master sits by him that begins and keeps the tune aloud for the parish. Dined at home very well. And spent all the afternoon with my wife within doors—and getting a speech out of Hamlett, "to bee or not to bee," without book. In the evening, to sing psalms; and in came Mr. Hill to see me, and then he and I and the boy finely to sing; and so anon broke up after much pleasure. He gone, I to supper and so to prayers and to bed. As I get older I find that three things are more and more the case. First, I am secure enough to admit that my life is good but not perfect, that there are things I want to be so that are not. More precisely, I can admit that there are things I cannot attain because I have chosen others. More importantly, I can admit that those things I cannot attain are still good. Second, I find simple and traditional wisdom immediately helpful more often than complex philosophizing. The deep thinking is necessary for arriving at the right action as well as articulating it, but for help you can't turn to it in a pinch. Third, I often find traditional wisdom congruous with deep thinking. 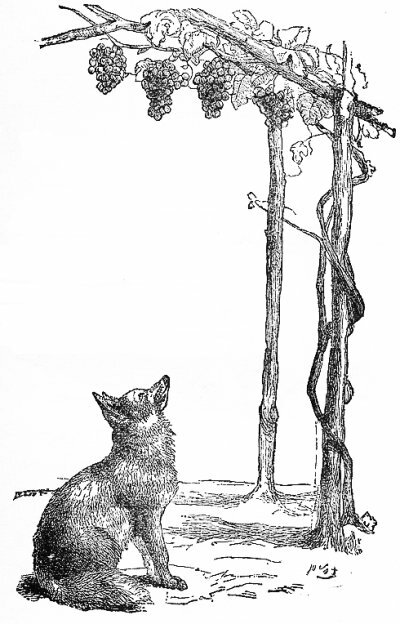 Take the case of Aesop's fable of the fox and the grapes. Who cannot sympathize with the fox, pining after the lofty grapes, and who does not see himself within that furry exterior, assuming that which he cannot attain must surely be rotten? It is a feeling of disdain born not from reasoned consideration of evidence, but of weakness. It is an attempt to devalue something so that you are raised. It is envy. It might seem at first erroneous to call the fox's feeling envy since no one else is getting the grapes, but another person is surely implied, for it is not the lack of desiderata that makes one envious, but rather it is their presence in the hands of others. No one would assume, for example, that there is nothing atop a mountain or that climbing it is foolish, simply because he wants to climb it and cannot. He simply regards the situation as impossible, and no one is bothered by what cannot be changed and cannot have been any other way. Rather it is the fact that someone else can or may climb the mountain that can makes one envious (if one wanted to climb it) because one realizes that it is possible for the but not for me. There are two brilliant chords in this definition. First, that we feel envy toward equals, be it of age, birth, wealth, or disposition. We do not care about the success of inferiors or superiors because we understand our situations to be so different from theirs that the outcomes are incomparable. Yet when we see someone who is so much the same, except more successful in one or more things, we wonder why our peer has surpassed us. With frightening speed our minds turn afoul: he has cheated, someone has helped him, he is only pretending success, his achievement is somehow incomplete or corrupted. Second, that envy is pain. Pain of perhaps the deepest and most afflicting kind because it is comes from an existential insult. Since there are many reasons not to do most things and plenty of reasons not to like most things, what one chooses to have and do very much make up the man. As a result, every action and act of possession is an affirmation of one thing and a rejection of others. Now we understand that very different people are just that, so their live invite little comparison to ours and therefore trouble us little. However, when we see an equal who lives differently than we do, we feel repudiated. When the difference is small we question our judgment, when it is great we feel that our character, will, and self—in essence our whole life and existence—have been repudiated. Such is why we find peace and calm in the presence of people who are like us: that they affirm that being who we are is good. Such a high degree of envy is liable to take on a different character, that of disgust, and such a combination is called contempt. When we are disgusted neither evidence nor even the characters of others matter in our appraisal. So deep is the insult to us that we reject the offending thing or deed as a contagion. The offense and its perpetrator or owner are incompatible with us and must be avoided as a disease. It is fitting that Aesop's fox calls the grapes sour, that is, bitter, the essence of what repels us. This condition seldom confines itself. "Contempt," Dr. Johnson in his Life of Blackmore writes, "is a kind of gangrene which, if it seizes one part of a character, corrupts all the rest by degrees." It spreads and spreads until you are unrecognizable to the world, with nothing of you in it nor it in you. Anything that is not already of you, or about you, sanctioned by you, or for you, is not just undesirable, but taboo. This madness is disgust at all otherness, which severs the last ties with reality. An ending ripe for tragedy. Perhaps, "Carolus illuminatio mea" ? 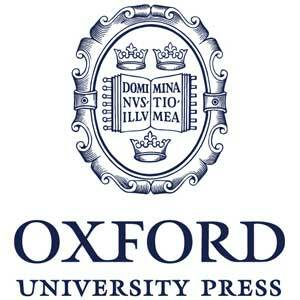 A few days ago I received via email and advertisement from Oxford University Press about their 50% Holiday Sale. That email came to me out of the blue, by the way, the first to have arrived at my inbox from OUP since I ordered my Oxford Latin Dictionary and Liddell Scott Greek Lexicon in college over a decade ago. Anyway I perused the titles and quickly noticed a particular bent. Take a few examples along with the descriptions from OUP, which are often hilariously cliche-ridden. I'm not sure whether we can handle any more "explorations" or the earth any more "ground-breaking." The Warren Court of the 1950s and 1960s was the most liberal in American history. Yet within a few short years, new appointments redirected the Court in a more conservative direction, a trend that continued for decades. A ground-breaking analysis of why most employment discrimination cases are dismissed, despite evident discrimination. A trenchant argument for the urgency of population-level interventions in health -- and a strong rebuttal to those who question it. Rigid identity imaginings, especially religious identities, block our vision to the complexities of social life and press us into corners that trap us in identities that we often ourselves do not recognize, want, or know how to escape. By exploring the musical philosophy of Theodor W. Adorno through a wide range of the composer's music, Beethoven and Freedom arrives at a markedly different vision of freedom. Author Daniel KL Chua suggests that a more human and fragile concept of freedom can be found in the music that has less to do with the autonomy of the will and its stoical corollary than with questions of human relation, donation, and a yielding to radical alterity. As Frances Fox Piven and Richard Cloward argued in the early seventies, in a capitalist economy, social welfare policies alternatingly serve political and economic ends as circumstances dictate. In moments of political stability, governments emphasize a capitalistic work ethic (even if it means working a job that will leave one impoverished); when times are less politically stable, states liberalize welfare policies to recreate the conditions for political acquiescence. Sanford Schram argues in this new book that each shift produces its own path dependency even as it represents yet another iteration of what he (somewhat ironically) calls "ordinary capitalism," where the changes in market logic inevitably produce changes in the structure of the state. In today's ordinary capitalism, neoliberalism is the prevailing political-economic logic that has contributed significantly to unprecedented levels of inequality in an already unequal society. Mills argues that rather than bracket as an anomaly the role of racism in the development of liberal theory, we should see it as shaping that theory in fundamental ways. As feminists have urged us to see the dominant form of liberalism as a patriarchal liberalism, so too Mills suggests we should see it as a racialized liberalism. It is unsurprising, then, if contemporary liberalism has yet to deliver on the recognition of black rights and the correction of white wrongs. ...globalizing capitalism tends to reproduce social and spatial inequality; poverty's persistence is due to the ways in which wealth creation in some places results in impoverishment elsewhere. A Black intellectual class emerged that was disconnected from social movement organizing and beholden to white interests. Appeals to higher law became politically impotent: overly rational or overly sentimental. Recovering the Black natural law tradition provides a powerful resource for confronting police violence, mass incarceration, and today's gross racial inequities. Plenty of the books seem apolitical, but I can't account for the lack of non-leftist politics. I don't know, either, just what the apparent disparity might indicate. 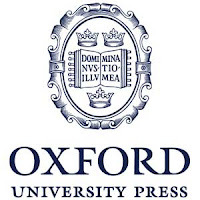 Perhaps left-leaning books are disproportionately printed at OUP, perhaps non-Marxist authors are being turned away or are not sought, perhaps non-Marxists authors seek publication elsewhere, or maybe the liberal stuff is just what's new, popular, put forward, or on sale. I'm not sure that any of that is good news.